Today’s Class 1 was really fast but really fun! 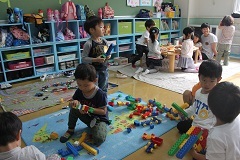 In the morning we had lots of fun playing with a trainee teacher, Honoka-sensei. We then learnt a little about different sicknesses and the children visited a doctor to get medicine for their symptoms, repeating, “I have a cough / runny nose / headache / tummy ache” very nicely. 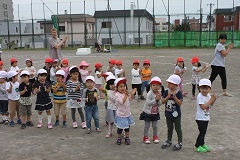 It was then time to go outside for today’s Sports Festival practice where we danced and rehearsed lining up nicely for the Closing Ceremony of the event. After coming inside it was almost time to go home, but we had the chance to listen to Honoka-sensei reading a fun Japanese book before thanking her for playing with us over the past 3 days. Everyone is getting more and more excited for the Sports Festival and we cannot wait to show you all our dances! See you all tomorrow Class 1, great job today!